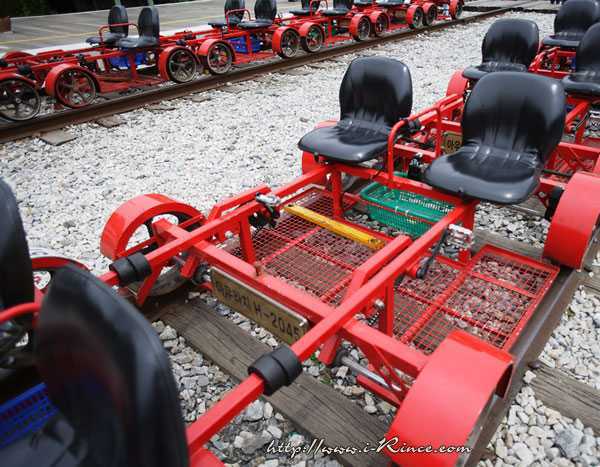 Don’t drive on the railroad tracks? 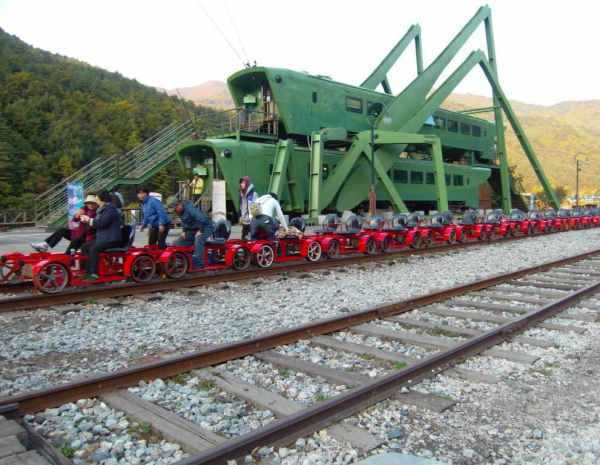 Good advice for Bill Murray but the Groundhog Day star never rode on South Korea’s Jeongseon Auraji Rail Bike route. 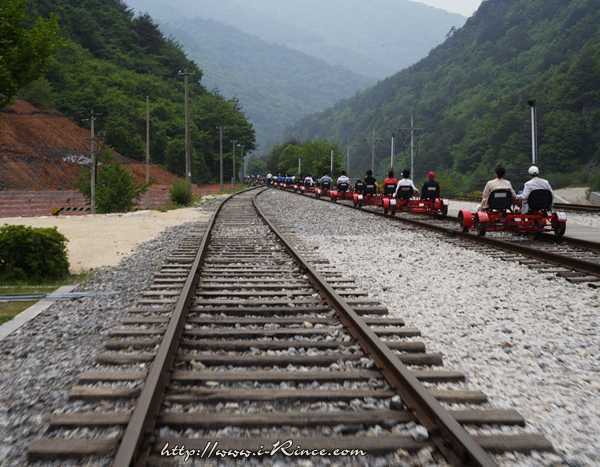 The Jeongseon Auraji Rail Bike route in South Korea’s northeastern Gangwon Province runs along a 7.2 kilometer (4.47 mile) long track between Jeongseon Auraji and Gujeol-ri stations, descending from the former to the latter on a slight downward grade that won’t tax even elderly rail-bikers. 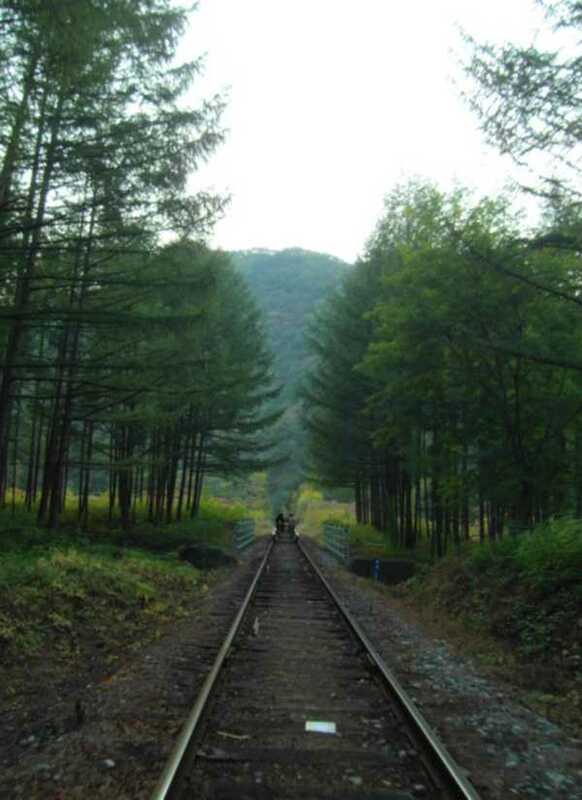 The route utilizes a railway that became obsolete and abandoned after 1999 when coal-mining operations in the area closed down. 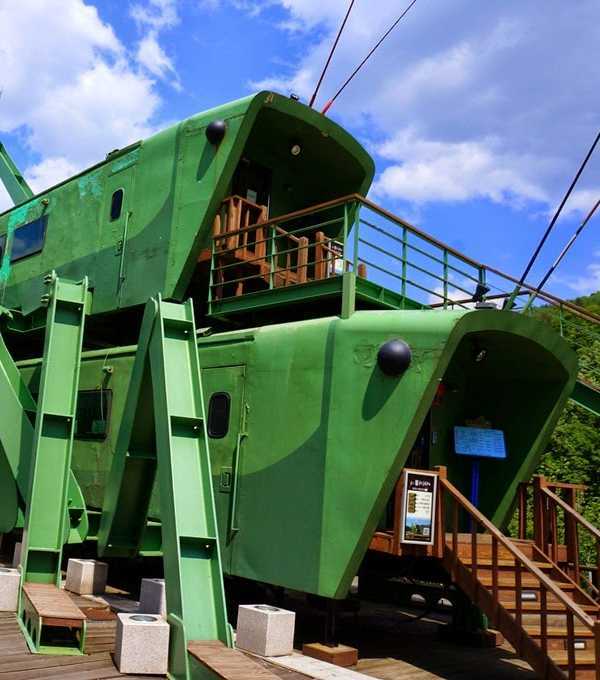 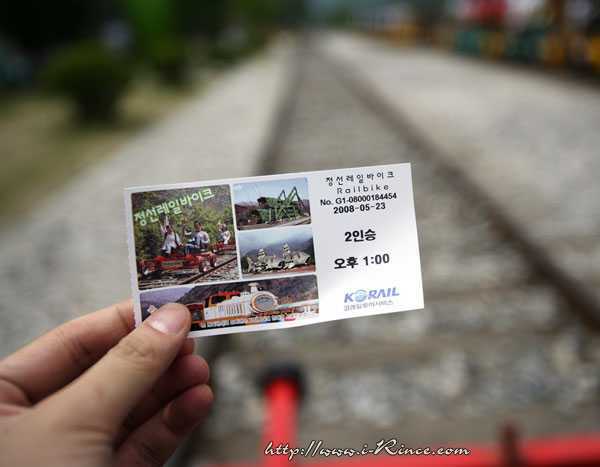 Korail (Korea Railroad Corporation, the state-owned railroad operator) and the national Korean tourism organization were reluctant to let the track fall into disrepair and at the same time, were seeking ways to boost the region’s economy. 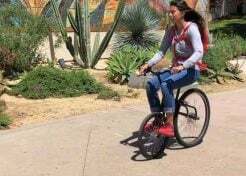 They found the answer to both conundrums by looking to Europe, where the “sport” of rail-biking has become popular in scenic areas once served by railroads. 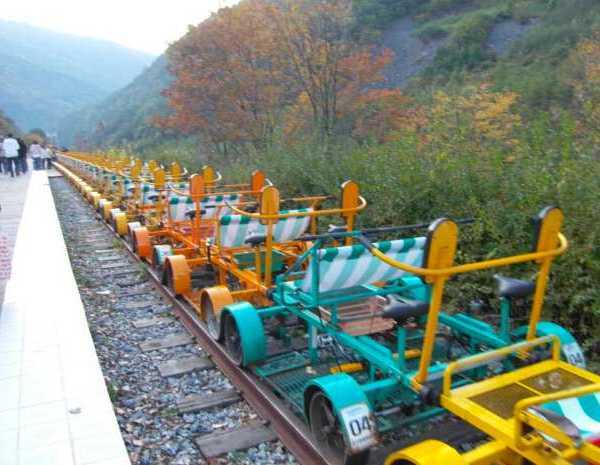 The most expensive aspect of establishing a rail bike route is the actual rails – exploiting recently disused railroads makes perfect economic sense! 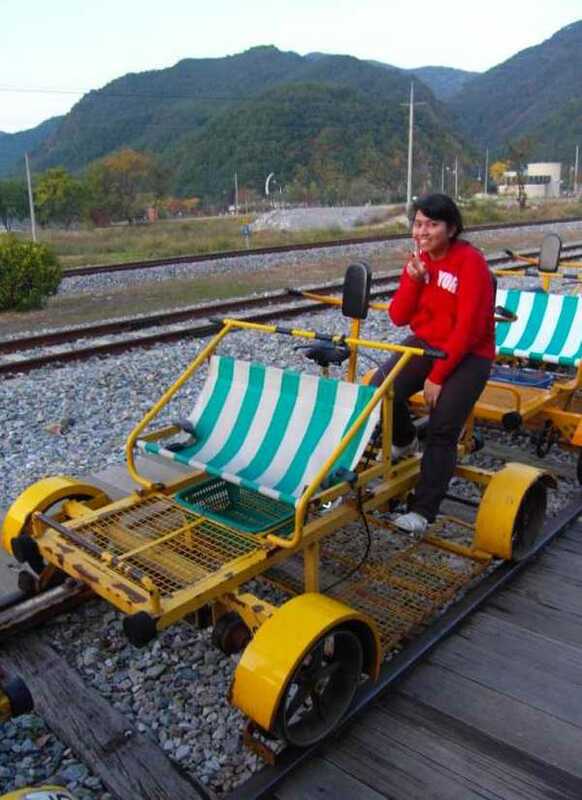 Korail even found a way to reuse and recycle some other bits of obsolete railway infrastructure, as can be seen at the rail bike route’s starting point at Gujeol-ri Station: a unique cafe called “A Grasshopper’s Dream” was built out of two disused train cars plus assorted rails and platform pieces. 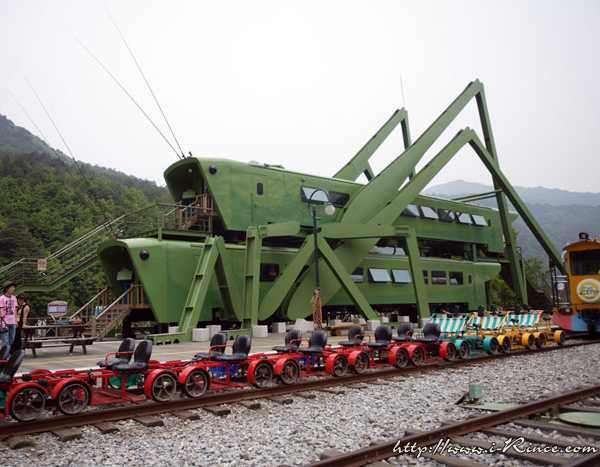 Never mind the cafe’s form brings to kind a pair of locusts doing the nasty – what better dream for a grasshopper than to be locked in a loving embrace for all eternity?